When I was a small child, I kept some treasures in a tin box hidden under my bed. In fact, my mother also put many crates, boxes and bags of different sizes there, too. We had to use all the space under all the beds in the house after we rented out our third floor to a rich married woman. I was quite happy to have so many things there as I found them useful as camouflage to divert any would be thief’s bad intentions toward my tin box. Very often, I had the urge to look at my treasures. To retrieve that box of mine was not an easy task. First, I needed to crawl under my bed and push aside all those dusty crates and other boxes, or I had to pull them out before I could reach it. This tedious work was not enjoyable, but I had to do it from time to time to ensure my peace of mind. During the cold winter days, it was less tiring for me to take it out. However, in the hot summer, the sticky humid air under the bed, mixed with the dust and my sweat could be quite a messy experience. Usually, my white shirt became quite black as a result. Often, my mother scolded me for dirtying my clean shirt within a day. Well how could I blame her for that, after all, it was mother who had to hand wash all our clothes every day. 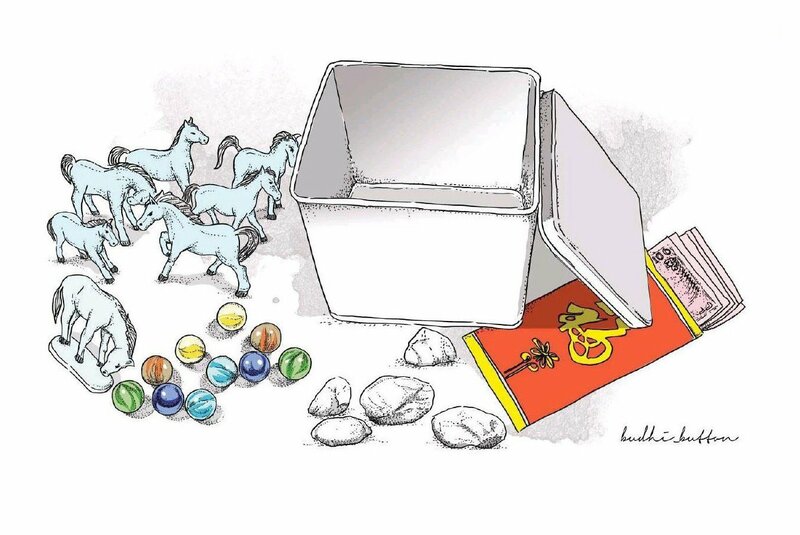 However, the final moment of happiness belonged to me alone when I opened the lid of my box to see the treasures I had collected over the years: the colorful marbles, the white flint stones and the eight blue miniature porcelain horses in eight different postures. I found them in a small junk shop in the back alley behind my mother’s house in Shanghai. Sometimes, on a bright Sunday morning when my brothers were out of the house, I would seize the opportunity to give all my treasures, except the flint stones, a cold-water bath. I placed them in water in a large washbasin on the balcony. Then I would watch with fascination as the sunrays played tricks on the water, making the marbles grow bigger and more colorful. But it was also disappointing to see my lean, handsome porcelain horses becoming fat and their slender long legs crooked and shorter than before. Later I would dry them one by one with a piece of soft cloth and very carefully line them up on a table for a long, close look. It was often in such a silent magical moment as my eyes inched closer and closer toward the edge of the tabletop that the porcelain horses, all of a sudden, would become alive and in high spirits. They would parade before me as a group and then each of them would show off its skills in different postures before they tossed their long manes and bushy tails in the air and galloped away. Sometimes I would watch them chase one another wildly on the tabletop. One time, one of the horses ran so fast it failed to stop in time when it reached the edge of the table. It fell to the floor below and broke all his slender legs. I spent the whole day using glue to repair it broken legs but it never regained it former posture. It walked with a limp. I usually had one other important ritual to perform. It was to take out a ang pau hidden among layers of paper, from the bottom of my tin box. It was a very private moment. I did not want anybody to see me holding it in my hand while squeezing it gently to get a feel of its contents. Then I would take a peep through its small opening to make sure that all my new banknotes were safe and sound. They were pocket money I had saved over the long years plus the ang pau money given to me by my mother at Chinese New Year. I felt rich when I counted the money and at the same time inhaled the unique smell of the new crisp banknotes repeatedly. Every time after I had finished the grand inspection of my treasures, I would return them to their usual hiding place. Sometimes while I huddled under my bed with my tin box, I wondered if adults could really understand or appreciate a child’s strong emotions attached to his collection of toys and his very own saved up pocket money, stashed away in his own secret place. One day, I heard that my elder brother needed money to cover our household expenses. Shanghai was then under Japanese occupation, and the war had cut off the lifeline between our father in Indonesia and us in China. Just the way he commanded me to let him have my money upset me most. It was as if the sky was falling when he finally forced me to take my new banknotes out of my box and hand them over to him. I was so powerless. I finally broke out in a loud cry, went straight to my mother and cried and cried until my heart ached. Mother did her best to calm me down, but she could not help me much other than to urge me not to cry. She also tried to hide the sad and worried look on her face by looking away from me. Later that day, my brother gave me a check for the money he took from me. He said I could cash it at a bank if I wanted to. I was then too young to understand what a check was. His act confused me as I took it from his hand anyway while my tears were still pouring down my cheeks. Reluctantly, I inserted the check into my empty ang pau. However, I found the good old wonderful feeling that used to accompany me whenever my hands touched it was now missing. Things were never the same again! Some months later, my brother finally broke my heart and destroyed my hope when I discovered that his check was nothing but a piece of worthless paper. I became very depressed after that episode. Gradually, I began to neglect my tin box. At night, I dared not even think about it. One afternoon, feeling lonely, I crawled under my bed to get a look at my little box. I found that the big crates and boxes were squeezed into a dark corner. It was so sorrowful to see my once cheerful shiny box, now so pitiful and covered with a thick layer of dust. I did not have the heart to take it out for a look because I knew it would break my heart and make me sad again. I do not remember what had happened to my colorful marbles, the white flint stones and the beautiful blue porcelain horses. What I do know is that they once gave me a sense of happiness and pride and the sweet dreams of my childhood. Moreover, they were a very important part of the character forming years of my life. The writer is a retired art and antique collector. He likes to write short stories based on his childhood and life experiences in his spare time. Born in Shanghai in 1932, he left for Jakarta at the age of 19.